Welcome to Patch 3.24! The Heatwave Summer Event is here, and we’re celebrating this smoking hot summer with bonus login Gold, 5 skins, a KO fx, Avatars, and a new podium in Malhalla! We also have 3v3 Beachbrawl for BotW, the Sandstorm chest, reduced the price for Lin Fei, changed the weekly Legend rotation, map fixes, bug fixes, and a balance pass. 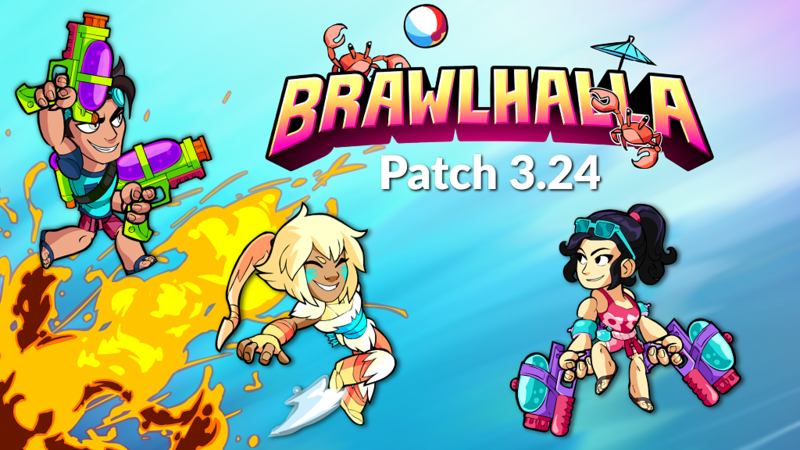 Time for a Beachbrawl party! What better way to beat the heat than throwing water balloons at beach balls to score goals in a 3v3 Summer throw down? Get 1 point for each beach ball you get past the opposing team’s goal. Most points at the end of 2 minutes wins! Queue alone or with a friend! Heatwave Summer Event is sizzlin’ up! A bonus 250 Gold on top of every daily login during Heatwave! New Heatwave 2018 Podium is here in the hottest style! Heatwave Colors for every Legend! All snowballs have been replaced with water balloons for this event! The Sandstorm Chest has emerged! Sandstorm Chest is in the store for a limited-time with exclusive skins. Lin Fei’s price is now 5400g! The news page now automatically displays the first time you login after a patch. Fixed a small visual bug on Grumpy Temple to smooth out a seam. Fixed Grumpy Temple music track to loop correctly. The Wheel’s player respawns will include item spawns on all 4 platforms instead of always spawning on top. Update the respawns on the Test Map Wheel, so that players can spawn on each of the 4 platforms instead of always at the top (where you’d sometimes fall an abnormally long distance when respawning). 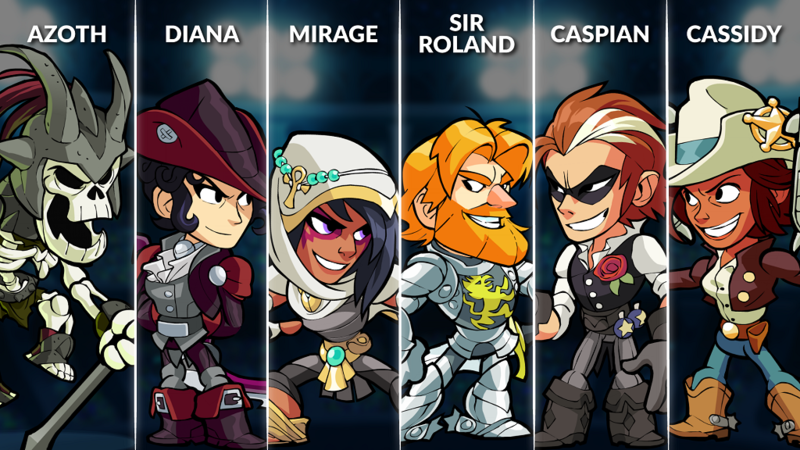 This week’s Legend Rotation includes: Cassidy, Roland, Azoth, Diana, Mirage and Caspian. Roland – A proud knight, Sir Roland seeks victory in the halls of Valhalla with his Sword and Rocket Lance! Fixed a bug that kept people from being able to unlock the “Let’s Do This Again Next Week” achievement/trophy. Fixed a bug that could cause small variations in spawn position or speed when entering sudden death. PS4: Fixed a bug that could cause the game to crash if you tried to spectate a game that had already been going on for more than 10 minutes. We have made a number of improvements for underperforming weapons by speeding up some of their key tools in the neutral game. We have also increased the overall speed on a number of Signatures that were either too slow to be desirable options, or carried too much risk for their level of reward. Lin Fei in particular has received her first round of post-launch adjustments. The Neutral Light is one of the Blasters most important tools when establishing stage control, however players would often choose other attacks in close to mid range due to the lengthy commitment of this attack. We have sped up the overall time of the Neutral Light for quicker zone control on the ground. Blasters Neutral Light: Decreased time between the first and second shot from 15 to 13. The Bow has received increases in movement speed to its Side Light, enabling more aggressive use of this attack in more scenarios. This should help the Bow’s ground game feel more mobile and assist in keeping up with other weapons. The Bow’s air game has received a faster Neutral Air for a quicker response at close range. Bow Side Light: Slightly Increased speed during the initial swing; Slightly Increased maximum speed bonus from movement such as dashing during the initial swing. Bow Neutral Air: Decreased Time to Hit from 10 to 9. Similar to the Blasters, the Hammer’s Neutral Light felt stiffer than its other options at close range. Following the same philosophy, we have sped up the rate of attack on the initial kicks, as well as decreased the Recover time on miss, for better use as a check in the neutral game. Hammer Neutral Light: Decreased time between the first and second kick from 12 to 11; Decreased Recover on miss from 0 Fixed/15 Variable to 0 Fixed/13 Variable. The Cannon is capable of great rewards off of its combo and string starters, and so we have sped up the Time to Hit of the Down Light. This enables Cannon players to more reliably use this attack, with more consistency at finding its way past an opponent’s defenses. Cannon Down Light: Decreased Time to Hit from 14 to 13. The Lance’s Recovery attack has received an increase in Time to Hit to decrease leniency when used as a followup from the Side Light. In return, it has received a compressed charge time resulting in faster scaling to its current maximum distance, damage, and force. This gives it greater use as a tool for covering distance back to stage or catching fleeing opponents when used as a dodge read. Lance Recovery: Increased Minimum Charge time from 8 to 12; Decreased Maximum Charge time from 65 to 55 resulting in faster distance scaling. With the Katars having several good anti-air options, the Katar Neutral Light could be used by itself in a number of situations too easily. We have increased the Cooldown time on miss to require the use of more diverse attacks to combat different angles. Katars Neutral Light: Increased Cooldown on miss from 8 to 13. The Gauntlets have incredible pressure during offstage gameplay, so we have increased the risk on a couple of its most rewarding aerial attacks. The Side Air will now begin to fall more quickly, risking the user’s vertical advantage on miss, as well as making it easier to anti-air a missed attack on stage. The Ground Pound attack on release has received some extra Recover time, to not only risk more of its vertical advantage, but also to allow greater counterplay for players who correctly identify the direction of the attack and maneuver behind it. Gauntlets Side Air: Gravity takes over 3 frames sooner during Recover time on miss. Gauntlets Ground Pound: Increased Recover time on release from 3 Fixed/19 Variable to 3 Fixed/21 Variable. The Scythe has traded some coverage on its string starters for more fluid feel on some of its slower attacks. The Side Light and Down Light have received decreases in their rear and top coverage respectively, to require more intentional use of these attacks. In return, the Down Air has received less Recover time on miss as it has one of the lengthiest Recover times on weapon base kits. The Scythe Neutral Air (forward version) has received increased Stun for better pursuit on hit, as well as a reduction in force that trades knockout power for continued pressure at wider damage ranges. Scythe Side Light: Slightly Decreased coverage toward the rear of the first swing. Scythe Down Light: Slightly Decreased coverage near the top of the swing; Decreased Hit Window from 7 to 5. Scythe Neutral Air: Increased Stun of the forward version from 24 to 26; Decreased Force of the forward version from 54 Fixed/46 Variable to 48 Fixed/40 Variable. Scythe Down Air: Decreased Recover time on miss from 2 Fixed/24 Variable to 1 Fixed/24 Variable. The Signature adjustments are center around improving underused attacks for underperforming Legends, as players will notice an increase in ease of use and responsiveness for a number of the following powers. Lin Fei had a number of Signatures that had too much total commitment time, or were too slow to be effective in their role as an anti-air. Isaiah, Thatch, and Xull see increases in attack responsiveness and speed for some of their slower attacks, as they previously took too long to reach opponents, and should now be more desirable options in a wider range of situations. Yumiko’s Down Bow leans further into its unique role as a combo/string starter with a moderate Stun increase for a greater number of followup options. Lin Fei Side Katar: Decreased Recover time from 21 to 18. Lin Fei Neutral Katar: Decreased total Recover time from 14 to 11. Lin Fei Neutral Cannon: Decreased Minimum Charge time from 11 to 8. Isaiah Side Cannon: Increased movement speed during the attack. Thatch Neutral Sword: Decreased Minimum Charge time from 14 to 12. Yumiko Down Bow: Increased Stun from 17 to 20. Xull Down Axe: Decreased total Recover time from 29 to 26. Xull Side Axe: Decreased Time to hit from 19 to 17; Increased priority during the run; Increased speed during the run. Xull Down Cannon: Increased Force from 60 Fixed/53 Variable to 60 Fixed/55 Variable; Decreased charge time between the second and third explosion from 19 to 15; Decreased Recover time from 23 to 21.